A Northwest Iowa family that has demonstrated courage, tenacity and integrity in the face of competition and powerful, entrenched local interests is the winner of the 2017 Tom and Pat Gish Award from the Institute for Rural Journalism and Community Issues, publisher of The Rural Blog. The Cullen family publishes the Storm Lake Times, a twice-weekly newspaper that has focused attention on water-pollution issues in Iowa, often to the dislike of agribusiness interests that are sources of much of the pollution. “We’ve lost some friends, we’ve lost subscriptions; for a while, lost some ads,” said Art Cullen, editor and co-owner of the paper started by his brother John more than 27 years ago. This year Art Cullen won the Pulitzer Prize for editorial writing, for a series of columns about pollution in the Raccoon River, which supplies water for Iowa’s capital and largest city, Des Moines. He and his son Tom also wrote many news stories about the issue. Following their reporting, the Des Moines Water Works sued the drainage districts of Buena Vista, Calhoun and Sac counties for failing to stop the pollution. The Times forced the release of public records that showed major agribusiness interests were paying for the suit’s defense. Courts ruled the districts couldn’t be sued, but the suit and the Pulitzer Prize focused more attention on the issue. Art Cullen says “The terms of the debate are changing,” and the amount of farmland in cover crops that prevent pollution has doubled in the past year. Cullen’s Pulitzer-winning columns had punch. He wrote in March 2016, "Anyone with eyes and a nose knows in his gut that Iowa has the dirtiest surface water in America. It is choking the waterworks and the Gulf of Mexico. It is causing oxygen deprivation in Northwest Iowa glacial lakes. It has caused us to spend millions upon millions trying to clean up Storm Lake, the victim of more than a century of explosive soil erosion." The Pulitzer committee said the editorials were “fueled by tenacious reporting, impressive expertise and engaging writing that successfully challenged powerful corporate agricultural interests.” Much of that reporting was done by Tom Cullen. Art’s wife, Dolores, also reports and takes photographs for the paper, and John’s wife, Mary, writes a recipe column. The family dog, Mabel, is there, too. The Times began reporting and editorializing about pollution from farms about a year after it was established in June 1990, first looking at concentrated hog-farming operations. It has brought to light other environmental concerns, such as the need to dredge Storm Lake, and issues surrounding the livestock-processing plants that have brought many immigrants to Buena Vista County, in the heart of socially and politically conservative northwest Iowa. In one of his most recent Editorial Notebooks, Art Cullen wrote, “Many of my ignorant friends conflate people of color with their having lost control of their own destiny; they don’t realize they never had control of it. It’s harder to hate the Chicago Board of Trade than it is a Mexican who doesn’t like American football or can’t speak English. They voted for Barack Obama to take on the Board of Trade and Wall Street. He didn’t,” so they voted for Donald Trump. The Tom and Pat Gish Award is named for the late couple who published The Mountain Eagle at Whitesburg, Ky., for more than 50 years and became nationally known for their battles with coal operators and politicians, and the firebombing of their office by a Whitesburg policeman. Their son, Eagle Editor-Publisher Ben Gish, is on the award selection committee. 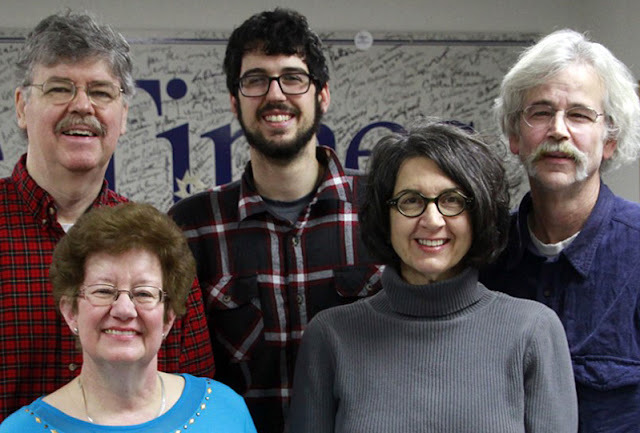 “It is encouraging to know that small, family-owned-and-operated community newspapers like the Storm Lake Times and Editor Art Cullen are still here and doing their jobs in very difficult circumstances with the same courage and tenacity exhibited by my parents,” Ben Gish said. Past winners of the award have been the Gishes; the Ezzell family of The Canadian (Texas) Record; publisher Jim Prince and former publisher Stan Dearman of The Neshoba Democrat in Philadelphia, Miss. ; Samantha Swindler, columnist for The Oregonian, for her work in rural Kentucky and Texas; Stanley Nelson and the Concordia Sentinel of Ferriday, La. ; Jonathan and Susan Austin for their newspaper work in Yancey County, N.C.; the late Landon Wills of the McLean County News in Western Kentucky; the Trapp family of the Rio Grande Sun in Española, N.M.; and Ivan Foley of the Platte County Landmark in Platte City, Mo. Cross will present the 2017 Gish Award to the Cullen family at the annual convention of the Iowa Newspaper Association in Des Moines on Feb. 2. Nominations for the 2018 Gish Award are being accepted at 122 Grehan Journalism Building, University of Kentucky, Lexington KY 40506-0042 or via email to al.cross@uky.edu.